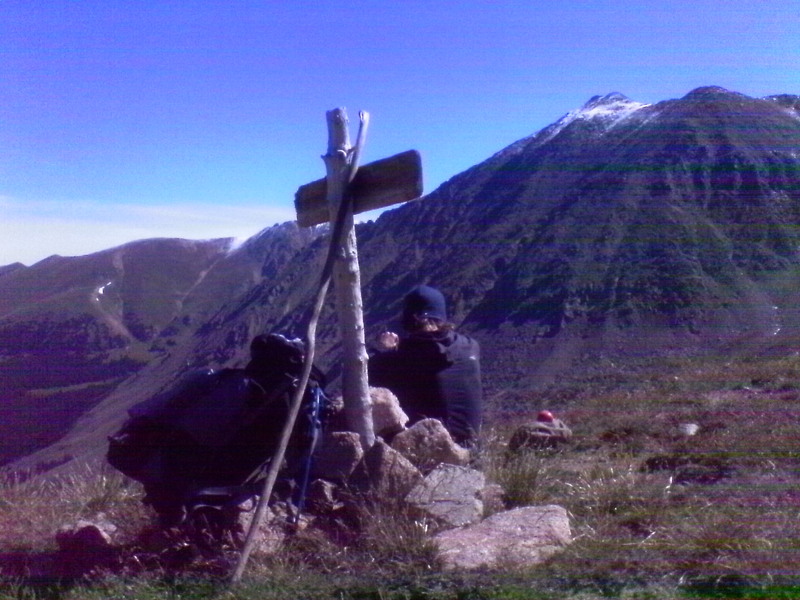 Upon gaining the alpine traverse. South Fork Trail is an unsung local beauty. Just outside the attentive, well funded, and volunteer active Summit County, trail signs along this loop trail are sparse and the few you encounter, are old. The trail is becoming washed out in some of the steeper areas and several stretches of the hike are faint use trails rather than anything established. In two days out there we encountered only one other hiker. A Thru-hiker, and those are a breed apart. Aside from him there were cavalcades and hunters. The hunters suggested if I wanted to keep the area pristine I “don’t be goin’ and writing no review of this hike in them hiker magazines.” Their double negatives were almost as confusing as the fact that I had been picking up cigarette butts and beef jerky trash all the way down the mountain valley. I don’t think having more hikers on the trail would have a negative impact, and such astounding views and hard earned climbs can be nothing but a good for each of us, so I say GO. The Loop trail can be taken from either direction, although I was happy with our anti-clockwise trek as I felt ascending South Fork Williams Creek was more gradual than along Williams Fork and Bobtail Creek. Also, the trail was generally distinct coming up that way, allowing us to get used to its ‘style’, thus helping navigate down the spotty trail along William’s Fork. 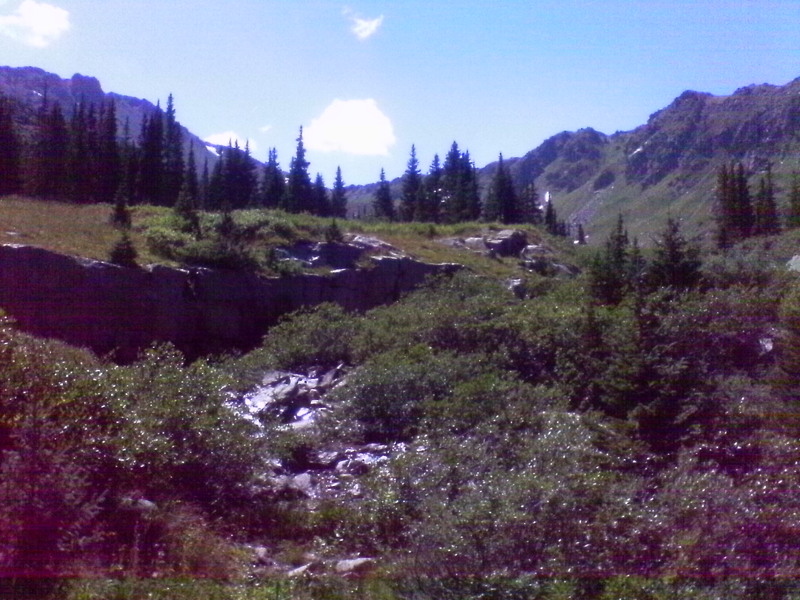 The ascent in this direction ended with a climb along a babbling creek in an open shaft of meadow. Horses nickered in the cool morning air, attesting to campsites tucked into the trees along the way. We breached the saddle and the “connect the dots” ridge run game began. Cairns of varying accuracy and size dotted our course. Some use trails dropped lower than necessary, others climb only to descend again. There would be a distinct trail for 15 feet, then, nothing. 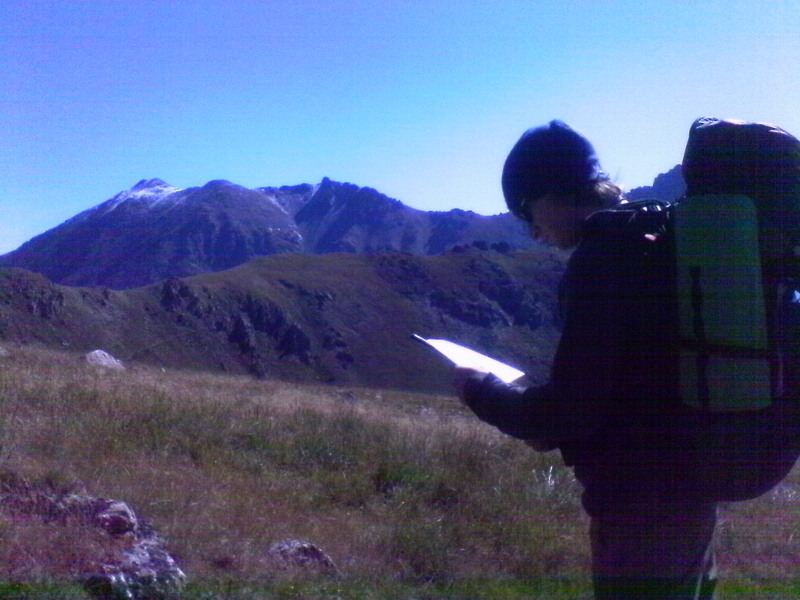 It was assuring to have BenJammin’ there to confirm or redirect my map reading, and we wound around the peaks and rises, walking on grasses and lichens adorned with frosty diamonds and cupping tiny pockets of hail. 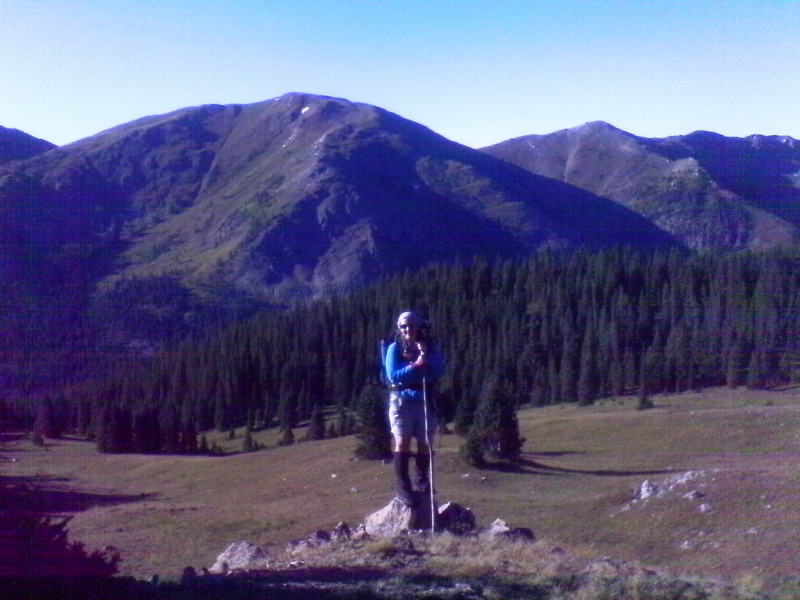 We hiked Eastward, where Pettingell (13553 ft) dominated the view. A fresh dusting of snow adorned only those highest of places while the leftovers from last year hung along the lip of the overhung ridges. We hiked around a few sizable patches. It was clear this was an early fall hike, as yellow has begun to tinge the valleys. Layers of ranges stretched out in all directions. BenJammin’ was able to identify several. I was most entertained by the Gore Range, protruding jaggedly along the sky line. The jutting formations seemed to be giving bunny ears to the Williams Fork Mountains, innocently standing in the foreground. We found ourselves looking up and around often. Passing from one bowl to another, we tested out echoes, some of which took seconds to reverberate, much to my delight. The trail drops along a valley littered with boulders shed from the flanks Pettingell and Hagar, up along the CDT. Melt streaked the massive faces and the water sources continued to be surprisingly high for this time of year. Down along the babbling, marshy creek, sometimes winding through the Pine, we passed several phenomenal established sites. Further down, where ths trees take over completely we passed a modern mining structure which feeds down to the main building we had passed on our way in to the trail head. Henderson Tunnel extends more than 10 miles. At one point, skipping along the stream, I came upon a rusted old gold pan rumpled amoung the rocks while the massive pipe chugged dutifully by; a testament to human development. After the first building we followed a dirt road for a short distance before dropping back onto the trail which cut just below what was appeared to be a staff bunk house. It was down here that we encountered the hunters; fortunately most of them were still just making their way out for the weekend. Of those I spoke with, there was a distinctively possessive lilt to their language. Riding high, we zoomed down the valley. For a few miles it was an abandoned dirt road before narrowing back into single track. Sometimes losing the trail altogether and bushwhacking through deep grasses and shrubs before the trail reappeared. After a few miles, the enchantment began to wear off. Our boots filled with fiery lava and clouds gathered threateningly overhead. I think BenJammin’ and I were both done with the trail a good 2 miles before it was done with us. The trail became increasingly muddy. So much so that by the time we saw the boardwalk 200 yards across the bog, neither of us hesitated to drop into the waist deep, stinking, sucking filth, rather than hike the extra bit to the next campground and looping back up. Gaining the other side of the boardwalk, we squished and squelched along, stepping around the bits damaged by falling trees, or simply fallen away altogether. By the time we made our way along the Sugar Loaf Campground road the Duellie trucks hauling trailers and 4-Wheelers saw a couple of soggy, muddy, hikers leaning heavily on the staffs which the many stream crossings had necessitated. We hobbled in their dusty wakes. I crawled up the stairs to my house and lay on the floor of the bathtub, trying to regain my faith in water. Then Anne called and invited me to a grill out at Joel’s. Her parents are in town and it was a veritable feast. Turkey bacon wrapped jalapenos stuffed with cream cheese. Brushcettaed salmon flanks, kabobs, brats, home made potatoes and mac’n’cheese. I all but fell asleep in a satiated stupor at the table. It was a well earned day. Thanks. We are considering a 2-3 backpack around the loop. Your comments are helpful. Awesome! Just remember to bring sunscreen b/c you do go alpine for a bit and the sun is a bakin’!